Silence, in peak season, too. Broken only by the call of owls. Perfectly pure air. An armchair view of the Besbre river valley, of deer and sometimes even foxes, and the myriad stars, surrounded only by nature and beautiful things. 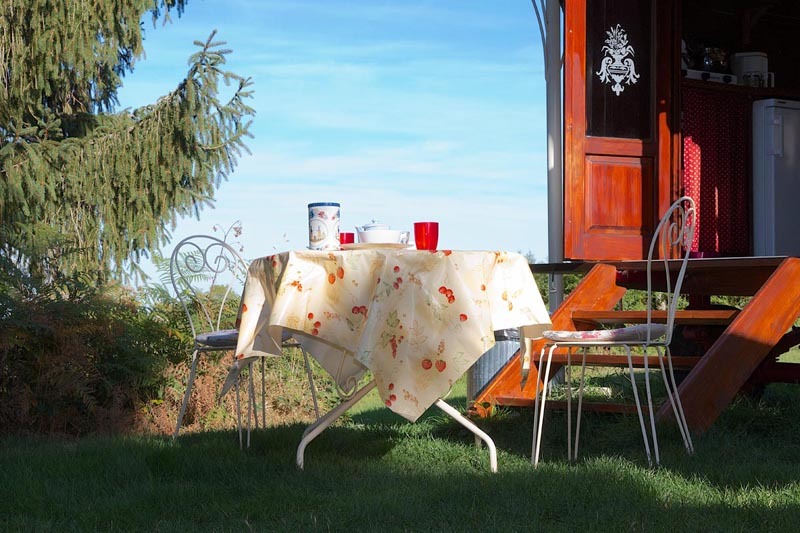 This is how your vacation will be at a romantic wheeled cottage or “roulotte”, as they say in France, at la Grande Serve, high in the pristine landscape of the Bourbonnais mountains, looking out on the Besbre valley and Monts de la Madeleine. 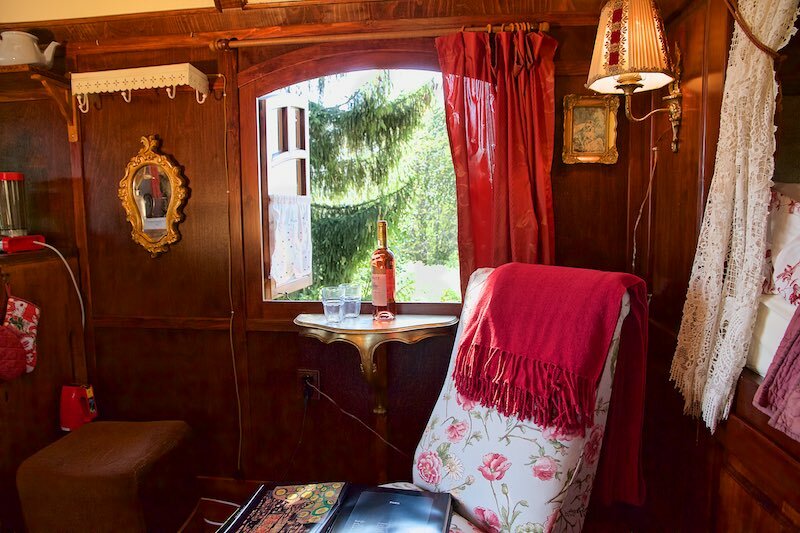 Cognac is a lovely styled wooden gypsy wagon. Decorated in style, with French brocante that is found at the many flea markets in summer. 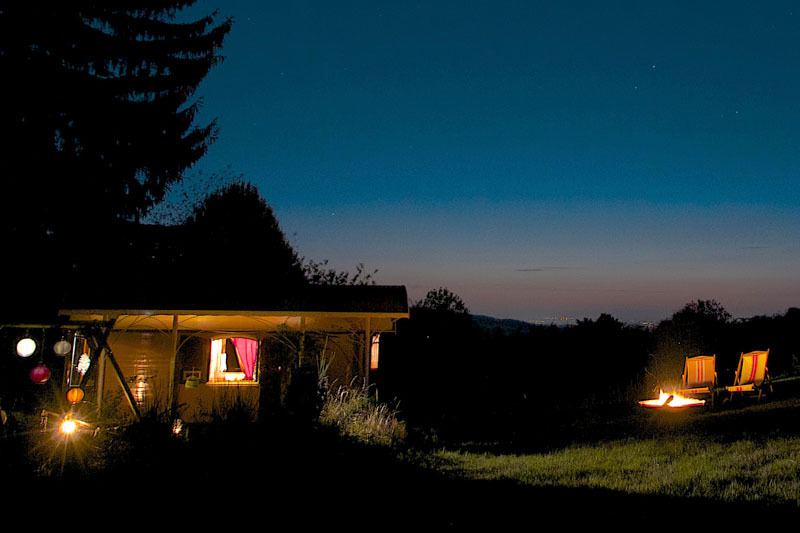 La Grande Serve is the ultimate holiday spot for peace seekers, nature lovers and bon vivants. People who appreciate beautiful things and original styling. Cognac’s bathroom (toilet, shower, sink) is built on old hay wagon, at the outside it looks like the real thing, but at the inside is a lovely decorated modern bathroom. Private space is a sparse issue for our guests and so we treasure it. Your private space is large and the gypsywagon is quite far away from the old farm. You can relax beside your roulotte next to your own fire pit, under the trees, take a sunbath and enjoy your view over the mountains. The wagon has a kitchenette with a gas stove and a refrigerator. If you need a bit more space, you could also use the large stove in the ‘cuisine d’été’ and eat at the large wooden table. And of course you could use your fire pit for a nice barbecue. Free WIFI is provided. 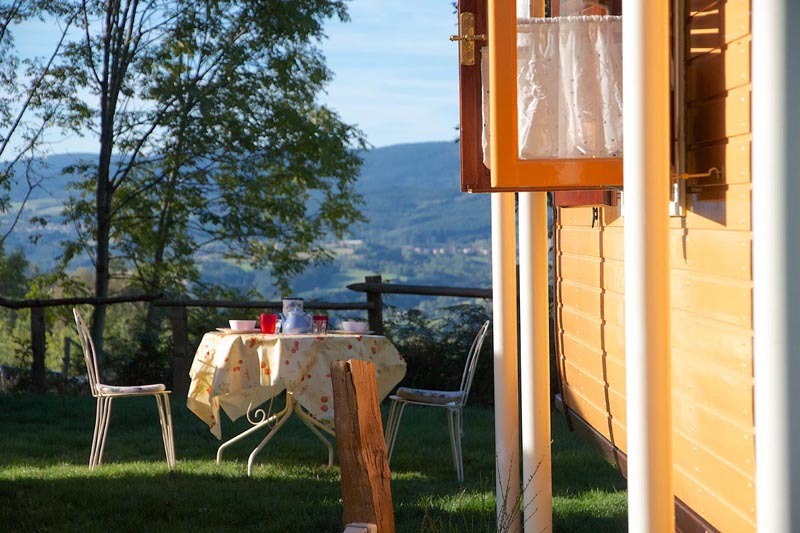 La Grande Serve belongs to the tiny village La Chabanne and is located 780 meters above sea level at the end of a dirt road protected by the woods on the one side and a spectacular view on the Besbre Valley and the “Monts de La Madeleine”. The region is also known as the ‘little Switzerland’ of France because of the region’s exceptionally pure air. 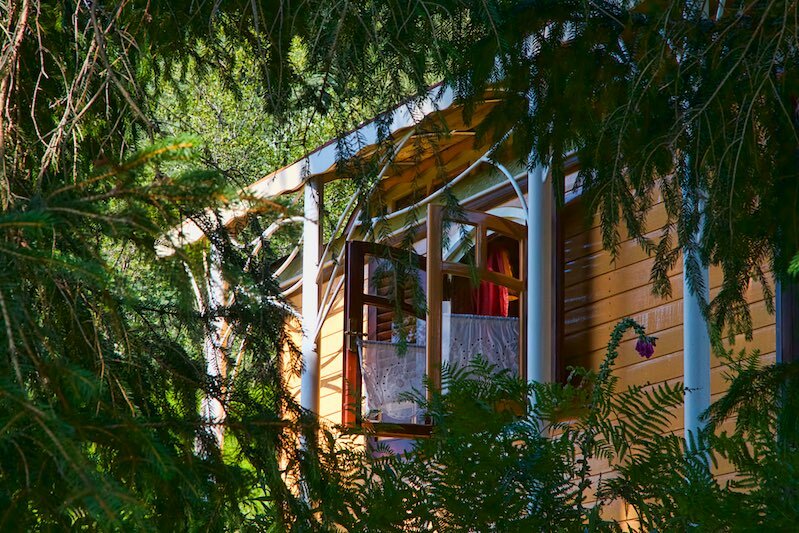 Surrounding la Grande Serve is a pristine landscape of mixed forests, hamlets, farms and tiny villages, dotted with streams, country roads and walking paths. 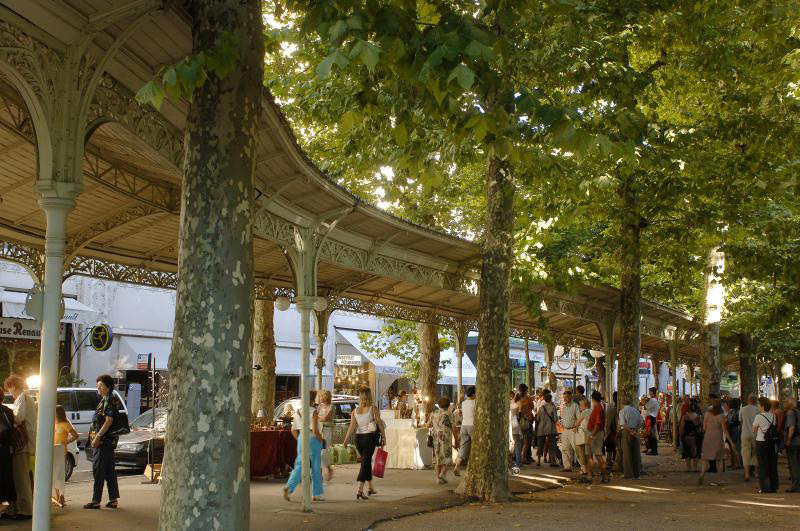 However, the cities of Roanne and Vichy are both only about 45 minutes away by car, so you won’t feel isolated. This is the spot to mountain bike, f.e. 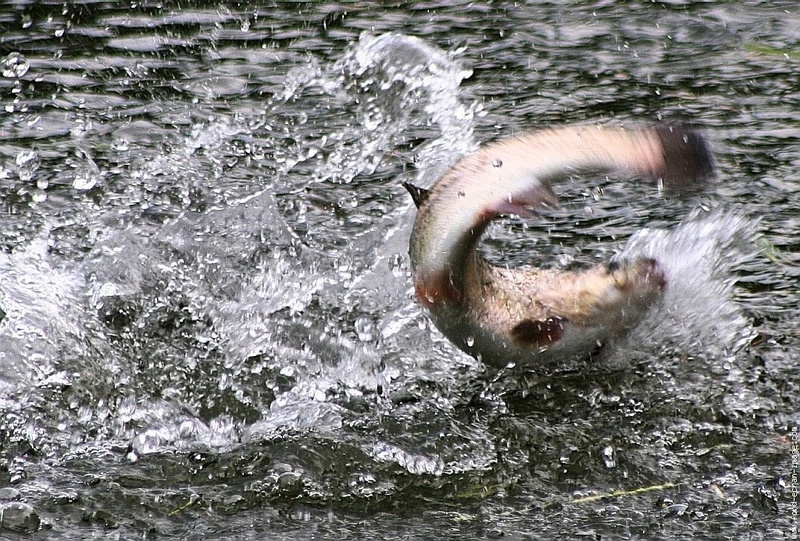 on our electric powered bikes, fish, read, hike, and eat like a king. It’s about a 3-kilometre ride to the village, but by foot, it’s only 600 meters. You can wine and dine in the village at the Auberge des Campanules. Groceries and vegetables and fresh bread (3 times a week) can also be found at the Auberge. The nearest large town is Le Mayet de Montagne, 12 kilometres away, with everything from a supermarket to medical facilities. We love living in nature and we trying our best not to disturb it. So, we use as many recycled materials as possible, for warming use locally forested wood, use water from our own source, don’t use any toxic products and separate our waste. We have practically no lighting on our terrain to not to disturb nature and of course not to spoil the lovely view on thousands of stars. 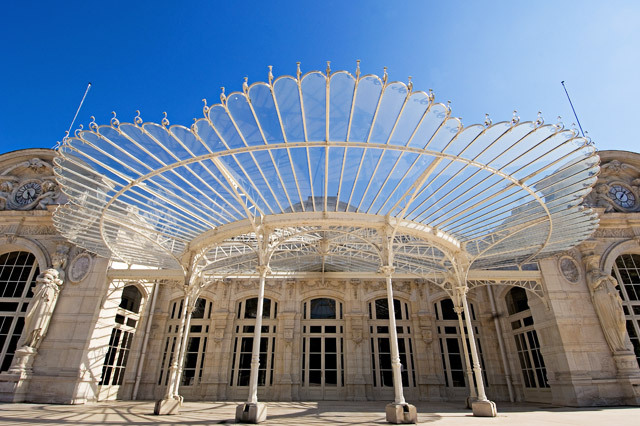 If you want to come by train, we offer a taxi service from and to Roanne or Vichy. “Cognac” is situated on an open spot next to large fir trees. The view over the valley of the river ‘Besbre’ is spectacular. The meadow on the right is the spot were you are most likely to see deer or even foxes playing in the last light of the sunset. In Cognac, you sleep in a very cosy bedstead. 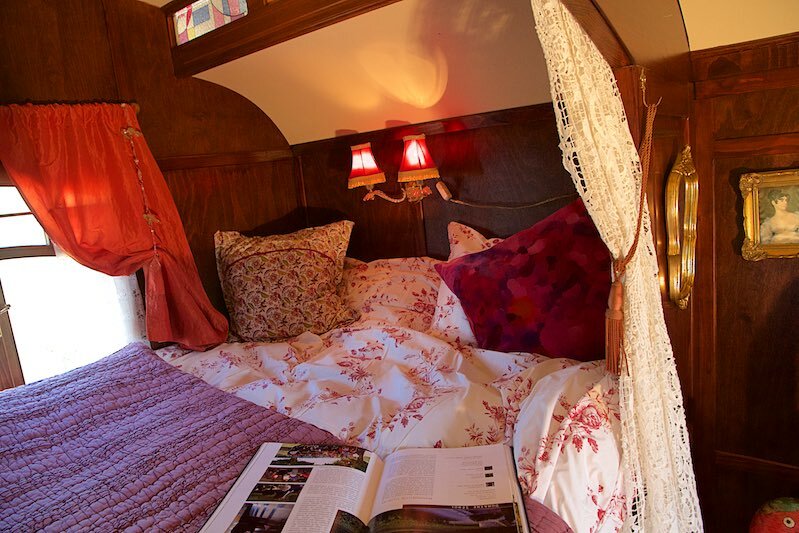 Cosy but large: the bed measures 2.25 in length, so it’s very suitable for tall people. There is a kitchenette, a table plus chairs and an armchair to relax in. Outdoors, you can dispose of a dining corner, a hammock and loungers a fire pit and a water tap. If you opt for an active vacation, you’ll find everything you need nearby, from hiking, horseback riding, archery, swimming and mountain boarding. 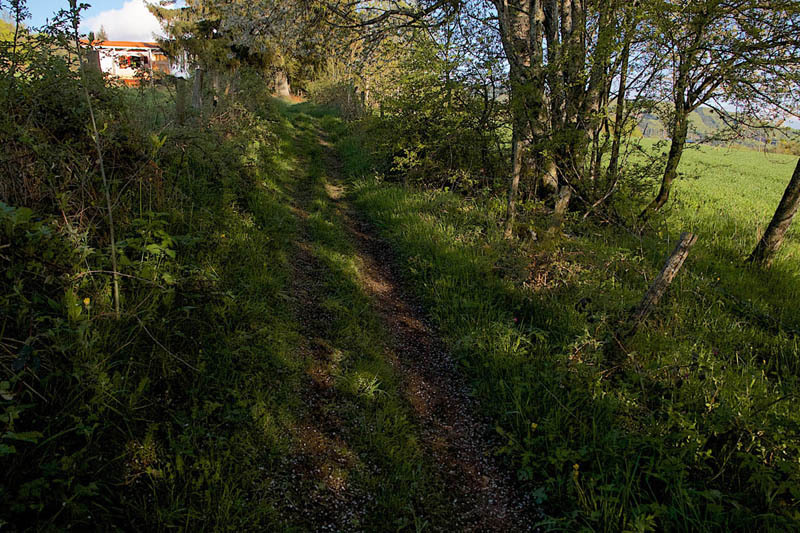 From La Grande Serve, you can discover miles and miles of well indicated hiking routes, ranging from strolls of less than a hour to multi-day hikes and everything between. Practically all the hiking routs are circular walks. The Bourbonnais landscape is very varied so both amateurs of meadows and of woods can be satisfied. The Montagne Bourbonnaise is not a steep like f.e. the Alps. Of course there could be steep rises and falls and you’ll need good, well profiled, hiking shoes but you don’t need to climb or anything. If walking goes to slow for you, you could try our electric assisted mountain bikes. You’ll still get your exercise, but it’s a lot easier than climbing the mountains on a regular mountain bike. The cities of Roanne and Vichy are both app. 45 car minutes away. Vichy is a lovely city in art deco. It’s famous for its medicinal sources where Napoleon already came to resource between battles. It still has a feeling of glamour, which is reflected in luxury shops, nice restaurants and terraces. It’s also a very green city with a lot of parks and a very nice Arboretum at the river Allier. In summer you can relax at ‘Vichy Plage’ a little beach to give you a bit of southern feeling. Roanne is at the other side of the mountain that forms the border to the “Loire” region. 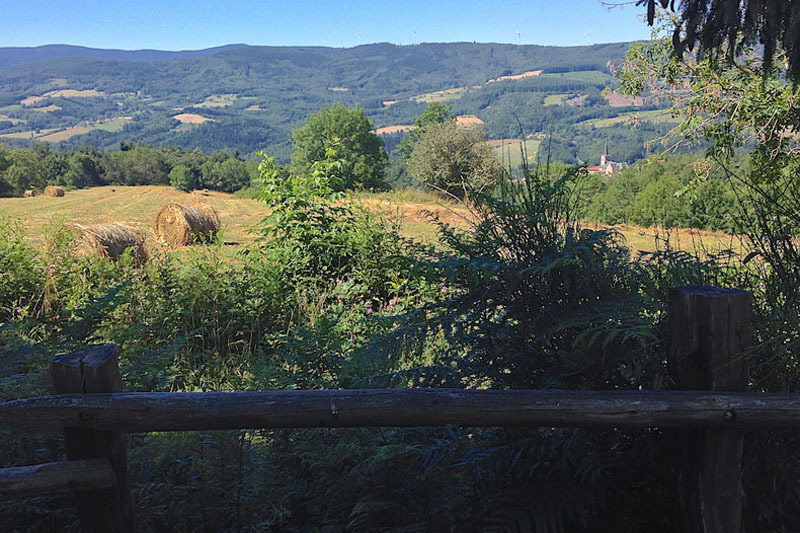 If only for the lovely views it’s already worth the trip to Roanne. You pass the vineyards of the ‘Côte Roannaise’ a region comparable with the ‘Beaujolais’wines. In Roanne you’ll find one of France finest restaurant: Les Trois Gros, of Michel Troisgros. Even Parisiens take the trouble to make the trip to the ‘province’ for his cuisine. The larger cities of Saint Etienne, Clermont-Ferrand (Puy de Dome) and Lyon are all very nice for a daytrip. The minimum stay is 2 nights. Electricity, water and taxes are inclusive. Arrival time: 16.00h-20.00h. Departure 10.00 h.
Bed linen is included in a stay for 1 week. Change of bed linen costs €7,50. Electrical heater costs €2,50 a day. If you use a navigation system without GPS you have to introduce the right postal code: 03250 AND La Chabanne. There are a lot of villages “La Chabanne” in France, and there are 2 La Grande Serve with the same postal code. Please let us know beforehand, if you’ll arrive later than 20.00 hrs. In the village, take the direction La Loge des Gardes (D177). After appr. 2 km, you see a little sand road on the left. “La Grande Serve ” is indicated. You take that little road, you keep to the left at each crossing, and after appr. 1,5 km, you arrive at “La Grande Serve “. In Roanne you take the direction “La Loge des Garde” and “Renaison”. Both are very poorly indicated. If you get lost, follow the signs “airport” and afterwards Renaison. A few km. before La Loge des Gardes you arrive at a crossing where La Chabanne is indicated to the right. 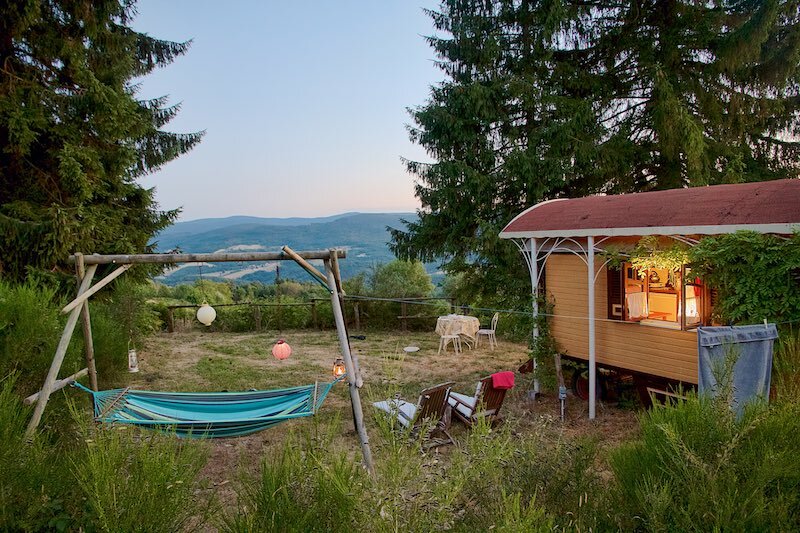 You pass a couple of hamlets, “Les Places” and at the right a wooden chalet with red shutters. 20 m. after a yellow-white pole indicating ‘Mayet de Montagne 14 “. the road makes a turn to the right. Appr. 50 m. after the turn there is a small sand road to the right. “La Grande Serve ” is indicated (on the right). You take that little road, you keep to the left at each crossing, and after appr. 1,5 km, you arrive at “La Grande Serve “.